Dubai Multi Commodities Centre (DMCC) and the World Gold Council have launched The Palm edition of the Visions of Dubai gold coin series. The coin features the image of His Highness Sheikh Mohammed Bin Rashid Al Maktoum, Vice President and Prime Minister of the UAE and Ruler of Dubai, on the front and The Palm Jumeirah on the reverse. The coin is 24-karat (999.9) gold and supported by the World Gold Council. 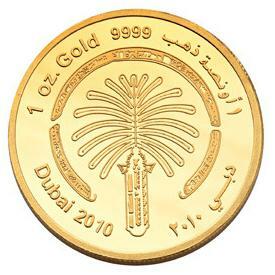 The coins are available at Dubai Duty Free and gold retailers, as well as through DMCC.